Animal Welfare - What does it mean? The Australian Professional Rodeo Association is considered by many to be among the most progressive animal related sporting organisations in Australia in regard to Animal Welfare policies and procedures. APRA representatives were a part of the National Consultative Committee for Animal Welfare (NCCAW) for many years which was an advisory committee to the Government on Animal Welfare policy. Today our representatives hold a position on the Australian Animal Welfare Strategy Group which is again an advisory group to government in relation to all areas of animal welfare. The Australian Professional Rodeo Association and its members share the philosophy that animals should be treated humanely and with dignity. 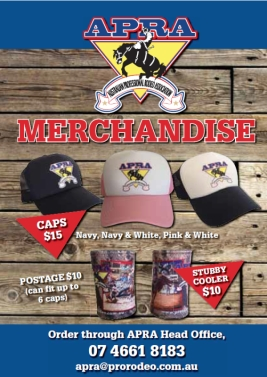 APRA rodeo livestock are valued by all those associated with the sport. They are the lifeblood of rodeo, safeguarded in rodeo competition by the APRA's strict animal welfare rules, first introduced in 1951 which was well before there was any legislative need for them. These rules have been modified and improved over the years, but not as a result of any external pressures but because they evolved with the development of rodeo itself. Now, the APRA's Voluntary Code of Conduct for the Welfare of Rodeo Livestock is generally recognised as the most comprehensive animal welfare document for any performance animal activity in Australia. The APRA's code incorporates not only its own rules but the best features of relevant animal welfare legislation, Commonwealth Model Codes of Practice and similar provisions for rodeo in the USA and Canada. It is essentially a 'best practice' document, to be used as a guide by rodeo people to ensure the welfare of rodeo animals. Penalties including possible disqualification from an event, fines and suspension. In April, 1996 South Australia was the first State to endorse the Code of Conduct, incorporating it as a Code of Practice as part of its animal welfare legislation. The South Australian Minister responsible for Animal Welfare, Hon. David Wotton, MP said about the Code, "Your organisations proactive stance augers well for the improved welfare and protection of rodeo animals and your close cooperation with South Australia's AWAC and the Office of Animal Welfare has been appreciated." Not only does the Code clearly define APRA policy that animals used in rodeo shall be treated humanely and with proper consideration for their health and welfare, it clearly identifies standards and procedures that must be followed for all rodeo events. Duty statements clearly set out the responsibilities of both rodeo livestock contractors and official judges. They are required to understand the Code and to be competent in rodeo animal welfare before they can get APRA accreditation. THE Australian Professional Rodeo Association holds animal welfare clinics in every state to ensure the welfare of competition animals is paramount. Former New South Wales assistant police commissioner Steve Bradshaw is the animal welfare representative on the board of the APRA and conducts the animal welfare clinics in each state. In 2012 the APRA has run animal welfare clinics in Victoria, Tasmania, South Australia, Northern Territory and one at Cloncurry in Queensland. Later this year clinics are being organised in New South Wales and south-east Queensland. The APRA is always pushing the importance of animal welfare, we receive signed reports from the judges after each rodeo which identify any injuries, the cause and the end result. There is a minimum standard for yards, chutes and arenas throughout Australia and all state regulations, standards and guidelines are strictly adhered to. All stock used in rodeos must be trialled prior to attending a rodeo and demonstrate that they are suitable for competition. rodeo livestock are always well fed and cared for. Experienced livestock owners and handlers agree that if animals are to reach their peak performance and maintain the highest standard they must be well cared for. Rodeo is an important part of the social fabric and economy of many rural communities. Often the annual rodeo is the biggest event in a community. Millions of dollars have been raised through rodeos for charities, community and sporting organisations. The sport of rodeo has developed as much in this country as in America. 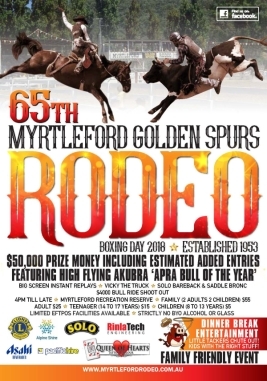 The first recorded rodeo offering prize money in the world was in America in 1883 at Pecos, Texas and our first recorded rodeo was at Gayndah in 1897. Over the past 15 years there have been over 330,000 usages of animals at APRA affiliated rodeos all over Australia. As every injury must be recorded at all APRA rodeo an extremely low injury rate is evident. Just one injury is recorded for every 3471 times an animal is used. One animal is severely injured or euthanised for every 5571 times an animal is used. Animal rights activists will claim that those figures are fabricated however to support these statistics I quote the injuries that were recorded by independent veterinarians that attended all Victorian APRA rodeos over the last 7 years. These injuries were compiled by the Victorian Animal Welfare Branch (DAFF). Rodeo livestock in Victoria were used on more than 50,000 occasions demonstrating that there was one injury for every 1780 times an animal was used (some of these were very minor and include slight lameness, bleeding noses and minor abrasions). For every 8300 times animals were used one unfortunately died or was euthanised. Some states may have their own Code of Practice Governing Rodeo.